we have been busy with many projects lately; maintaining forums and sites; designing new sites for friends and their organisations, and have begun designing IOS iPad versions of our softwares. These require quite a lot of changes, as our usual baffling batch of buttons, that allow users to realise the full potential of the programs, have to be incorporated on screen, and, with no title bar, we still want to keep the designs uncluttered; a tall task..
the size of the files to download has risen incredibly in recent years. Our Mac solutions for example have almost doubled in size, but with much faster and more prevalent Broadband usage everywhere, we find this to be not as big a problem as in days gone by. Intranet-like private group forums like this one here, allowing team discussion solutions for your business or organisation, from only 100 pounds. SoulTrader is a complete small business solution for self and multi employed, ideally suited to soletraders and small multi-tasking companies. 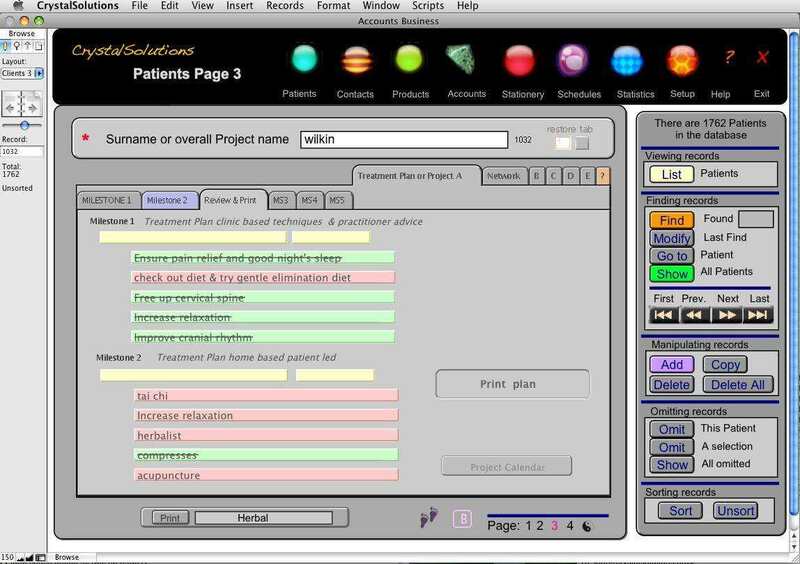 it has been designed and evolved from 10 years of experience from our CrystalSolutions Complementary Practice management software for alternative therapists and clinics. Booking systems that allow for day/week/month block booking of goods and service or holiday let. Booking by minute and hour by different users for different “rooms”, as used in a clinic type environment, or by different services being offered throughout the day. As the solution is very customizable, you can after learning its basic use, further tune it to your business, with over 100 editable drop down list fields and over 20 detail label fields, which can also be edited. add to this mass mailing snail or email, project planning, statistics, customers and supplier databases and a credit control area, if you really have to extend credit, (not recommended in these times!) stationery, product areas and account report summaries, all designed for quick input of information, the solution allows you to keep a better control of your different business interests and running of house and home. We for example keep a grip on complicated childcare admin and business, with the solution. (we have special needs children who require many part time helpers) as well as our business multi-tasking, with this software company, web enterprises, letting schemes and health practices. while we advocate pen and paper diary for day to day admin, the solution has calendars and schedule areas, and we find the program works best when we copy much of the paper diary notes to the client and account areas at the end of the day. You can of course do all this as the day progresses. with reminders easily set up and ways to find information extra to simple alphabetic sorts – this is where this program excels allowing you to quality audit your businesses and better target marketing and energies. 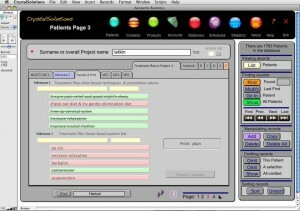 finally CrystalSolutions V9 full update released......with drag/drop installation (Mac) and a new treatment and project planning area…..
Free fully working Demo good for fifty records from CrystalSolutions…..
the project planning area designed for soultrader has been incorporated into Crystalsolutions as a treatment planning area and will be included in an early 2009 update. we have just added blockbooking to the Calendar & Schedules so as well as being able to book individual time slots within a day for any number of personnel or rooms, we can now block book daily slots, again for any number of rooms, units or properties. we are hoping to release a FREE working Demo, limited to 50 records like CrystalSolutions and which will be available for the same price – £68 ($127) via Kagi WHICH INCLUDES 3 MONTHS EMAIL/SKYPE SUPPORT. we have been busy beefing up the support and now have film tutorials, Help online and within the programme, as well as FAQ’s, How DO I’S and User Forums. ( I have been happy to use Skype to assist Registered users, when email support has been inadequate and 10 mins on skype can leave both parties much happier. We shall be using the webviewers in the software as we do in CrystalSolutions, and so if you wish us to include your site or company in the dropdown choices or even be the default for the relevant page – do contact us. – the Windows version has been neglected for too long and we now have virtual machines and Parallel installations to enable better testing. So i’ll be in XP by next week…. so what’s so wrong with a bit of nepotism?